Bose has always been a big player in the portable audio game. 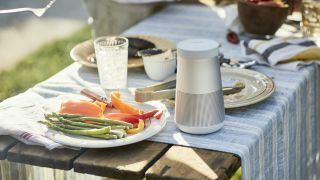 It was one of the first to conquer the market with its SoundLink, SoundLink Mini and SoundLink Color speakers but, according to Bose, it’s about to put all of those products to shame with its new Revolve and Revolve+ Bluetooth speakers. The Revolve and Revolve+ offer 360-degree sound – much like UE’s Boom series of speakers – with the added benefits of an IPX4-rating and Bose Connect, a feature that allows you to sync two speakers together for stereo playback. The Revolve is 6 x 3 ¼ inches (H x D), weighs a mere 1.5 pounds, and provides up to 12-hours of battery life. Revolve+ is slightly bigger at 7 ¼ x 4 inches (H x D), 2 pounds, and lasts for up to 16-hours on one charge. While we’ve seen 360-degree speakers a number of times already, but Bose has an interesting-sounding plan to put a new spin on it. Apparently, they’ll combine dual-opposing passive-radiators with a powerful, ultra-efficient transducer – positioned face-down – and a new patented acoustic deflector with an added “pressure trap” to eliminate distortion. This will cause sound to radiate uniformly in every direction, with deep, rich bass – without the sweet spots and frequency drop-offs of conventional 360-degree speakers. As far as additional features are concerned, the Revolve and Revolve+ have two compelling differentiators. First, both speakers are effectively splash-proof. They’re IPX4-rated, meaning they can withstand spills, rain and pool splashes – just don’t drop them in the pool. Bose says they’ll also be relatively shock-proof, too, able to survive dings, drops and bumps. Finally, both models will come with Bose Connect built-in allowing you to control them from your phone and, should you decide to pick up a second speaker, pair them together for stereo sound. So, when can you get your hands on one? The SoundLink Revolve and SoundLink Revolve+ Bluetooth speakers will be available beginning April 13 for $199 and $299 (about £159/£239 or AU$260/AU$395), respectively, and will come in two colors – Triple Black and Lux Gray.